You like wine, so why would you waste time with ineffective, hard-to-use corkscrews? Use the Centh wine opener instead and open every bottle of wine quickly and easily. It takes just five short steps to get the cork out and start enjoying your wine. Pull up and the cork is removed from the screw and you’re ready to enjoy your wine or open another bottle. That’s it! It takes just a second and is easier to use than any other corkscrew out there. If you have RSI, arthritis or any kind of hand pain, you need to give the Centh wine opener a try. The handles are ergonomically designed and easy to grip, and the mechanism makes using it easy and painless. The corkscrew set comes with a foil cutter and an extra screwpull, so you have everything you need to open bottles of wine for years to come. And it’s packaged in an elegant gift box, making it an ideal gift for any wine lover in your life. Pick up a few, because when your friends see yours, they’re going to want one for themselves. Your new wine bottle opener is backed by our 100% satisfaction guarantee, so if you’re not happy with it for any reason, we’ll replace it or refund your purchase price, with no questions asked. 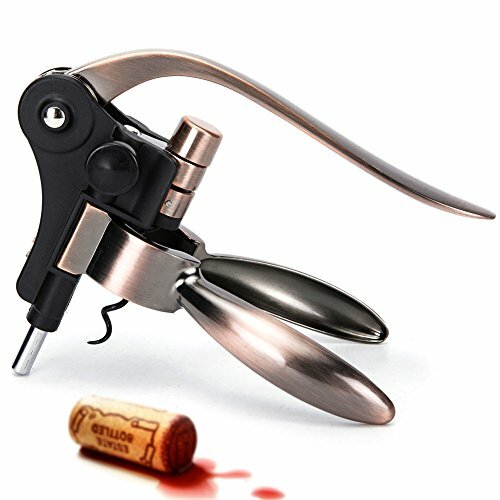 You’ll be thrilled with how the durable, metal corkscrew-the same kind professionals use-feels in your hand, with how strikingly handsome it looks and with how well it works. Place your order today before our supply runs out! If you have any questions about this product by Centh, contact us by completing and submitting the form below. If you are looking for a specif part number, please include it with your message.